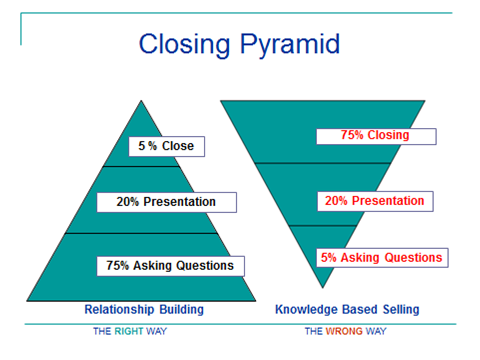 Closing insurance sales by using the closing pyramid concept. Using the concept of the closing pyramid. Closing insurance sales can be easy if you understand and implement this closing pyramid concept. Closing insurance sales has a right way and a wrong way. See the two different closing pyramids below and the caption below each one. Understanding the underlying factors between the right way and the wrong way, to close a sale, is what we will discuss in this article. One is labeled Relationship Building and the other is labeled Knowledge Based Selling. If you are not clear on this, then you should take a few minutes and read this article on " selling is a 95% people business and 5% product knowledge business." If you have not watched the Closing Pyramid Concept video, do so now, then return to this page. Take the time to read both pages. Don't just gloss over this and expect to learn anything. Study habits require patience and skill. Take a second and really look closely at these two pyramids below. One shows the wrong way and the other the right way to close. They show you the amount of time, in percentages, that are spent in in each type of closing scenario, which is reflected by the way the pyramids are sitting. Note the difference in the right way and the wrong way. What's meant by the "Wrong Way" closing pyramid concept ? They spend 5% in warm up, 20% doing the presentation, then 75% of their time trying to close because they never really found what it was that was going to trip that prospects trigger. How can you learn anything about anyone's dreams in 5 minutes. In other words they work the closing pyramid upside down. What they are doing is trying to sell people with their product knowledge. They of course feel their product is the best one out there, and because so, just assume the prospect should buy it because it is such a good product and your such a nice person. Just don't work that way. You need to change your mindset. Lets review the "Right Way" closing pyramid concept! The center piece of "closing insurance sales" should start after your chit chat is done, and once you sit down at the kitchen table. This is when the "right way" closing pyramid concept should be weaved into your presentation. It is at this point that we start the interrogation process, as I call it, and is the most critical part of the interview. There are many life insurance selling systems out there, but this process is what separates the really good closers from the mediocre closers, and the life insurance sales leaders from the average life insurance agents. When do we start closing insurance sales? Is it after the presentation? During the presentation. When??? The correct answer is as soon as you walk in the door, starting by using your relationship building skills. So how do we know what questions we should ask upfront? By asking the right questions upfront, we can diffuse many of the objections we normally encounter through out the interview and at the close of the sale. That is why this powerful confidential interview questionnaire I call the Confidential Questionnaire was created and fined tuned by me and my agents over many years. It is the heart of closing insurance sales and is a proven and tested process. The questions on this confidential questionnaire provides you the opportunity to find out what it is that this client actually invited you in their home for, while at the same time setting the stage/theme for a sale. Most agents walk in the door with a preconceived notion on what they want to sell, such as a mortgage term life insurance policy, a universal life insurance policy, financial planning program, etc. these are usually a form or target marketing. Sure that works, but if you want bigger life insurance sales and an ongoing future client, and want to close more sales, you need to really find out what their goals in life are. From seeing the kids playing baseball to Mom keeping her dream home, and to make sure those dreams can come through. This is called relationship building. You absolutely need to spend 50% to 75% of your time asking questions and listening if you really want to increase your life insurance sales closing ratio. Learn to Listen to what the prospect says in this questionnaire stage. Define their wants and needs. Many times people are just looking for an insurance consultant to help put them on a path of financial security. They are looking for direction. If you have a financial plan built for yourself, (not just a Life insurance policy) share that with them. Use your relationship building skills and some of these insurance selling tips. Now that you have discovered what they want in life, then you spend 20% of your time going through your presentation showing the prospect how your products' benefits and features will take care of the wants and needs you have uncovered. Help your children go to college? Let your family stay in their home if you die? Provide you with baby sitter and day care money if you loose your wife, etc. In the end, you should only spend about 5% of your time closing. Why 5%? Because if you properly went through the questionnaire, you and the prospect should have already agreed upon the wants and needs, and determined if they can afford it and do they want to do something about it today. Briefly review your product/policy and keep it simple. At this point, you only need to negotiate on which Insurance product best fits the situation, based on what they can afford. Closing is getting a series of small yes's to questions you ask along the way. You should never have to ask, "Do you want to buy this?" In the end, it should be, "Mr. Prospect, does this concept make sense to you? ”Can you see how these features would benefit you and your family and help accomplish the goals we talked about?" Then close with a couple of questions that require an answer to a simple question. "Would it be more convenient to make annual deposits or monthly deposits?" Mr. /Mrs. Prospect do you like this idea/concept that I just shared with you? Hopefully they say yes again. Can you see how this will help you accomplish one or all of the financial goals we talked about? “Hopefully another yes”. Mr. /Mrs. Prospect, you indicated to me in the beginning that you could set aside $75 to $100 per month if you liked what you seen. We can set that up to be transferred from your checking or savings account on a monthly basis into your account with our company, and when the program comes back I will sit down again with you and go through it more detail to make sure you are 100% clear on how it works. At this point you transition into filling out your application. Mr Prospect if you were to die prematurely, who would you want to receive these proceeds/money? If the requirement looks like a sizable life insurance sale, then I would get the money commitment and tell them that I would take this info back to office and take some serious time to work out some ideas and then come back and share with them what would work best. I would then reset second interview within a week so that things are still remembered. Make money selling insurance by using this pyramid process to conduct your interviews and enjoy closing insurance sales that become more profitable. In the end these clients will provide you with all the free life insurance leads you want in the form of referrals. You absolutely need to spend a good part of your time asking questions and Learning to Listen to your prospect before you even start your presentation. Doing so, will increase your ability in closing insurance sales as well as increasing your overall life insurance sales closing ratio. Define their wants and needs. Many times people are just looking for an insurance consultant to help put them on a path of financial security. They are looking for direction. They also need help with their mindset. Asking questions should help them with creating the reality of their situation. And finally, if you have a computerized financial plan built for yourself, (not just a Life insurance policy) share that with them. Use your relationship building skills and some of these insurance selling tips: such as "we are selling money not insurance". Power phrases like this will help you with closing insurance sales more often. Closing on the objection technique.